They say, “It’s better to see something once than to hear about it a thousand times.” This wisdom particularly applies to New Zealand, an otherworldly destination of glacial fjords, bubbling mud pools, rolling hills, and ancient forests. It’s a place so different, so unique, that it has served as the backdrop for the Lord of the Rings fantasy films. New Zealand is small but mighty. In size, it’s a bit bigger than Great Britain and a bit smaller than Japan. Its neighbor, Australia, is approximately 29 times larger. But New Zealand’s two islands pack a punch, and one can easily devote an entire vacation (or several vacations, for that matter) to exploring them. There’s simply so much to do and see. When you travel to New Zealand with us, you'll see this beautiful country from a whole new perspective and have the opportunity to immerse yourself in the culture. And once you arrive, here are seven things to do that will make your New Zealand journey remarkable. One of the most alluring things about New Zealand is the country’s stunning natural landscape. If you love to explore the great outdoors, New Zealand is for you. It just might be the greatest outdoors. Bay of Islands is one of the top destinations in New Zealand for just this reason. Here, over one hundred pristine islands are scattered across beautiful azure waters, just waiting for you to explore. You can hike, kayak, or even skydive here. It’s an excellent place for sailing—keep your eyes peeled for whales, dolphins, penguins, and other marine life. Then there’s the extraordinary Puketi State Forest, where ancient Kauri trees tower above, and thousands of glowworms illuminate the mysterious Kawiti Caves. In Tauranga, you can join us on a bike tour that brings the beauty of New Zealand into perspective. The easy trails along Tauranga’s Mount Maunganui will take you past stunning ocean viewpoints and the remains of ancient volcanoes. We can’t imagine a better way to explore the area! If you prefer to explore on two feet rather than two wheels, try our Zealandia Sanctuary And Otari-Wilton’s Bush Walk. Make your way through the unique flora and fauna of the Zealandia sanctuary, and get an up-close look at the breathtaking biodiversity that makes New Zealand so special. Then, gain expert insight on native New Zealand plants on a guided walk through the Otari Native Botanic Garden and Wilton's Bush Reserve. Whether you traverse New Zealand by bike, boat, or on foot, you’re bound to be amazed by the country’s breathtaking natural beauty. Māori culture is a vital part of New Zealand’s identity, and no trip to the country would be complete without learning about it. Māori are the indigenous people of New Zealand and make up 14% of the country’s population. The Māori first came to the islands of New Zealand from Polynesia more than a thousand years ago. In Bay of Islands, you can spend a full day learning about the history and culture of the Māori people at the Waitangi Treaty Grounds. Attend a handicrafts workshop to learn the art of flax weaving or make a traditional Māori flute, watch dance and weaponry performances, and tour the Museum of Waitangi. Mount Maunganui—also known by the Māori name Mauao—is a sacred place in Māori culture, and you can hike to the summit when we arrive in Tauranga. This area is also home to ancient Māori rock art, and there are several Māori villages surrounding the nearby geothermal area and town of Rotorua. A visit to the Māori Arts and Crafts Institute to watch expert wood carvers at work won’t disappoint. In Wellington, join us on an intimate and exclusive group tour of the Museum of New Zealand Te Papa Tongarewa for a deeper look at Māori artifacts, history, and customs. Many of the objects you'll see are not on display to the general public, and the insights from a Māori guide during the tour offer invaluable enlightenment. What is the cuisine of New Zealand? The best way to find out, of course, is by tasting it. New Zealand’s cuisine has strong similarities to British food, with roots in indigenous Māori culture and modern global influences. Hāngī is a traditional Māori cooking method still used today, mostly for special occasions. Hāngī food—often mutton, chicken, or pork along with root vegetables—is placed in a wire basket and cooked underground over hot stones for several hours. As an island nation, seafood is plentiful in New Zealand. Look for scallops, oysters, mussels, crayfish, king salmon, snapper, and pāua fritters. New Zealand lamb is world-renowned, and a favorite local menu item. If you're a foodie, you will love New Zealand. Wellington is particularly acclaimed for having incredible food, making the Flavors of Wellington a must-do shore excursion—especially for gastronomy fans. In Picton, seafood lovers will enjoy learning about New Zealand’s local salmon and Greenshell mussels on a trip aboard the fishing vessel Odyssea. It’s no surprise that the rugged coastal cliffs and lush, rolling hills of New Zealand make for some incredible golf. Golf has the highest participation rates of any sport among Kiwis, and New Zealand is considered a bucket list destination among globetrotting golfers. When you join us on a golf cruise to New Zealand, you'll have the opportunity to tee off at some of New Zealand’s best courses, and experts from PerryGolf will be onboard to oversee every aspect of your experience. One of the great joys of cruising with us is that you can visit many destinations, but only unpack once. Getting from Point A to Point B is a joy, not a hassle. For golfers, this voyage offers the opportunity to effortlessly include playing golf in your travel plans. The golf package includes five rounds of golf, with the option to add a sixth round at Jack’s Point in Queenstown, New Zealand. Highlights include the Cape Kidnappers and Kauri Cliffs courses, respectively ranked the 17th and 37th-greatest golf courses worldwide by Golf Digest in 2018. For architecture buffs, there’s a lot to love about New Zealand. Napier, New Zealand is particularly renowned for its Art Deco architecture. The Hawkes Bay Earthquake devastated the city in 1931. The quake lasted only a few minutes, but registered a 7.8 on the Richter scale and took at least 250 lives. Most buildings were destroyed. What followed was a building boom. In the next two years over 100 new buildings were erected, mostly in the popular and inexpensive Art Deco style. The style is known for pastel colors, boxy, linear structure, and geometric embellishments. Today, Napier is famous for its Art Deco architecture, and the buildings the are protected under the Art Deco Trust. Thousands of people visit every year for the Tremains Art Deco Festival. For a local perspective on the Napier's unique architecture, take an Art Deco tour on foot or by vintage car, during which experts offer insightful commentary. Dunedin, New Zealand, is also home to architectural gems. Larnach Castle is notable for being New Zealand’s only castle and is well worth a visit. The tower, ballroom, and impeccable surrounding gardens make it one of Dunedin’s top landmarks. As part of our Larnach Castle shore excursion, you'll enjoy traditional New Zealand morning tea during your visit, followed by a tour of the home and the Garden of International Significance—a modern botanical wonder the castle's current owner has been developing for more than half a century. Other landmarks include the beautiful University of Otago and the Dunedin Railway Station, pictured above. The station was constructed in the Flemish Renaissance style and opened in 1906. Its similarities to an elaborate gingerbread house earned its architect, George Troup, the nickname “Gingerbread George.” Be sure to venture inside when you visit, as the ornate interior features a gorgeous mosaic floor and porcelain frieze. New Zealand’s wine industry is relatively new, but robust. For wine aficionados, visiting a few wineries while traveling the country is a must. New Zealand has been producing wine since colonial times, though wine consumption in New Zealand didn’t truly take off until the 1960s. However, the New Zealand wine industry hit its stride around 1990, as the country began to gain a reputation for crisp, fresh Sauvignon Blanc wines. In the past fifteen years or so, both the number of wineries in New Zealand and the value of New Zealand wine exports have skyrocketed. In fact, Sauvignon Blanc makes up over 70% of wine production in New Zealand. The grape can be found on both the North and South islands of New Zealand but is particularly prominent in the famous Marlborough wine region. Marlborough is easily accessible via the port of Picton, and you'll have the opportunity to discover several of the region's top producers on the Wineries of Marlborough shore excursion when visiting. Or, focus your attention on Brancott Estate, Marlborough's premier winery, on a shore excursion that includes a private tasting and lunch. Although Marlborough is small in area, it is one of New Zealand’s premier wine regions. There are over 100 wineries here, many of them small, family-owned operations. New Zealand’s oldest and second-largest wine region is Hawke’s Bay, which you can explore on shore excursions from Napier. Hawke’s Bay is known for producing Chardonnay, Syrah, and red blends. Te Puia is a thermal reserve just 3km south of Rotorua’s city center. It boasts over 500 hot springs and at least 65 geysers. The most famous is Pohutu Geyser, which erupts up to 20 times a day, to heights of 30 meters. The thermal reserve is famous for its bubbling mud pools, erupting geysers, and Māori cultural significance. The Māori people have lived at Whakarewarewa for centuries. The name is abbreviated from “Te Whakarewarewatanga O Te Ope Taua A Wahiao,” which translates to “the gathering place for the war parties of Wahiao”—though it’s often further abbreviated to “Whaka” by locals. It was the site of the fortress of Ta Puia, known for being impenetrable. The Whakarewarewa Thermal Village is where locals reside. Here, you can learn about the Māori way of life and their traditions of woodcarving and flax weaving, buy authentic arts and crafts, and partake in a Hāngī feast. The Pohutu Geyser is visible from several vantage points in the village. Wai-O-Tapu is another thermal reserve, found 27km south of Rotorua. The name Wai-O-Tapu means “sacred waters.”. Geothermal activity here causes the hot springs to have colorful, multihued appearances. The most famous of the springs is the Champagne Pool, which bubbles like a glass of champagne thanks to an abundance of carbon dioxide. Rotorua’s Blue Baths are a museum and swimming pool. Opened in 1933, the Blue Baths are known for the building’s historic Spanish-inspired Art Deco architecture, geothermally heated swimming pools, and classic tearoom. Sitting atop the Rotorua Caldera is Lake Rotorua, the largest of sixteen lakes in the area. The volcano has not erupted for over 240,000 years. In the middle of the lake is Mokoia Island, a rhyolite lava dome. We think the best way to explore the lake is by boat—aboard the Lakeland Queen—while dining on a delicious buffet lunch. With our shore excursions from Tauranga, you’ll experience the best of New Zealand’s thermal wonderland. While the Lord of the Rings is fantasy—the natural beauty of New Zealand is very real and waiting for you to discover. Are you ready to join us for an unforgettable experience through the Land of the Long White Cloud? 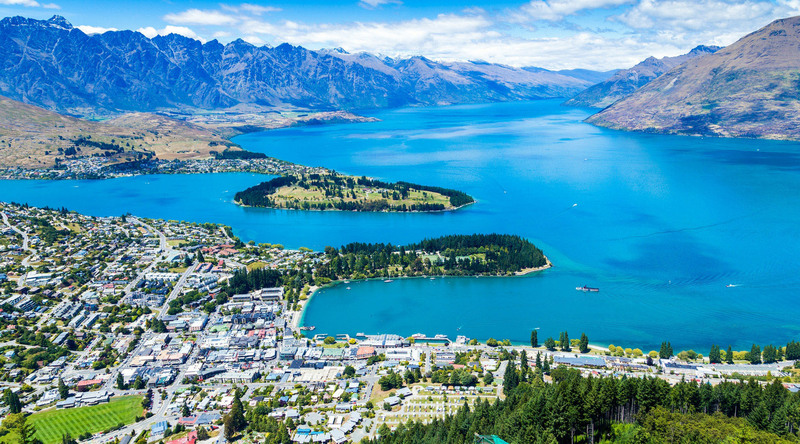 Browse our upcoming cruises to New Zealand today to get started.